← May I introduce myself? My name is Kanō Jigorō. Bōgu-tsuki Karate 防具付き空手 is one of various competition modi of Karate. It literally means “karate with protective equipment attached.” It refers to full-contact karate fights in which protective equipment is worn by the participants. As regards the term bōgu, while in Japanese koryū styles various kinds of protective equipment were developed and used for safe martial arts practice during the Edo era, there are no historical materials indicating that the term bōgu was used prior to the Meiji Restoration (1868). In Ryūkyū prior to 1872–79, too, there are no historical sources for the term bōgu and moreover there are also no sources that point to training using special protective equipment of any kind, except rare mentions of armor typically used by the military. This is the first known reference to the term bōgu in Japanese sources. Bōgu therefore referred to personal protective equipment used to practice Western-style military martial arts of the time. The passage in question in the “Kenjutsu Kyohan” 剣術教範, 1889. National Diet Library. Bōgu-tsuki Karate is also called Bōgu Karate 防具空手 and Purotekuto Karate プロテクト空手 (protector karate). Among the Bōgu-tsuki Karate also exists the method called Kōshiki Karate 硬式空手 (hard-style karate) with its characteristic point addition scoring system, according to which continuous techniques are summed up continuously. Kōshiki Karate is one kind of Bōgu-tsuki Karate, but it is not the same. The term kōshiki 硬式 means “hard-style” and is particuarly used as a comparative term to denote a regular, not-softened version, like in baseball vs. softball, and tennis vs. softball-tennis. Bōgu used in the Renshinkan (Zen Nihon Shōrin-ji-ryū Karate-dō Renmei). It is the oldest type used in Bōgu-tsuki Karate (except Kendō Bōgu, Baseball or other borrowed protective equipment). From left: head protector (men 面), chest protector (dō 胴), hand protector (kote 小手). Sometimes shin guards are also used. Bōgu-tsuki Karate refers to kumite training and competitions carried out by participants wearing protective equipment and with actual impact of blows. While in the broad sense it is a kind of full contact karate, since the use of bōgu was originally part of some pre-war karate experts, and since the protective equipment (bōgu) and kumite rules were purposefully improved and perfected over many years in the postwar era, and since its implementation preceded the modern sundome (non-contact) modus, the organizations which practice Bōgu-tsuki Karate are classified as traditional schools of karate. As a competition format of karate, the history of Bōgu-tsuki Karate is also older than that of the sundome (non-contact of the new JKF) as well as that of unprotected full contact rules (Kyokushin etc.). The first nation-wide tournament in the world of karate was also carried out under Bōgu-tsuki rules. However, since the establishment of the new JKF in the 1960s, sundome (non-contact) rules are the mainstream format seen in karate kumite. In the public perception of karate, and mostly due to marketing activities and media coverage, Bōgu-tsuki Karate falls far back behind the modi of sundome (non-contact) of JKF/WKF and non-protector full-contact (Kyokushin etc. ), which results in an oblique presentation of what karate actually was and is, or how karate became what it is today. Furthermore, as regards postwar Okinawa karate, it had been rarely observed that postwar bogu kumite in Okinawa also directly originated in the development of the Bōgu-tsuki Karate on the mainland. Therefore, in this article I attempt to rectify this oblique presentation. After Funakoshi Gichin attended the 1st Physical Education Exhibition in 1922, which was sponsored by the Ministry of Education, he took the opportunity and moved to Tōkyō to teach karate. In contrast to the training of karate in Okinawa, which emphasized the instruction of young people and students in kata, in the mainland the creation of promised sparring (yakusoku kumite) and the implementation of sparring matches (kumite shiai) were attempted. Kumite at Tōkyō Imperial University in 1929. In 1927 the Karate Kenkyūkai 唐手研究会 of Tōkyō Imperial University independently devised Bōgu-tsuki Karate and performed karate matches with it. This was spearheaded by Bō Hideo 坊秀男 (1904–1990), later president of the Wadōkai and Japanese Minister of Finance. Funakoshi, the shihan at the time, was enraged about this move. The situation escalated until in 1929 Funakoshi resigned as the shihan of the Tōkyō Imperial University. 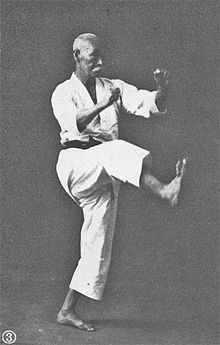 Funakoshi’s motivation to deny these karate matches is unknown, but according to his early disciples Ōtsuka Hironori 大塚博紀 (1892–1982; Wadō-ryū) and Konishi Yasuhiro 小西康裕 (Shindō Jinen-ryū 神道自然流), when Funakoshi in 1922 moved to Tōkyō he brought 15 original kata, which were all that he taught and he hardly knew any kumite. 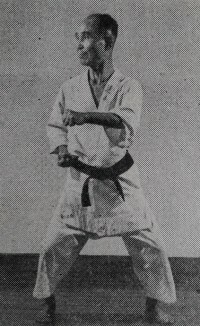 Picture of Yabu Kentsū at Bogu-tsuki Kumite. On the other hand, in Okinawa kumite practice with protective equipment began with Yabu Kentsū (1866–1937) at the Okinawa Prefecture Normal School, and Miyagi Chōjun (1888–1953) is also said to have experimented with it. Moreover, there was Itosu’s student Tōyama Kanken 遠山寛賢, who moved to Tōkyō in 1931 and opened the Shūdōkan 修道舘 as a dōjō to teach legitimate Okinawa karate on the mainland. Originally established in front of Tōkyō Asakusa Ishihama Elementary School, it was moved to Meguro in 1937, where it housed a boarding dormitory for karate students. It should be noted that the dōjō was situated adjacent to the Hatoyama Nursery School, of which Toyama was the principal. 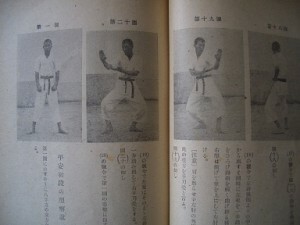 A number of students of Toyama would later play a major role in the postwar development of Bōgu-tsuki Karate. Taira Shinken wearing bōgu, according to Nakamoto Masahiro around 1932. In addition, on the mainland such persons as Motobu Chōki (Motobu-ryū), Taira Shinken (Ryūkyū Kobudō, pre-Shōtōkan karate), Mabuni Kenwa (Shitō-ryū), Sawayama Muneomi 澤山宗海 (1906–1977; Nihon Kenpō), and Yamaguchi Gōgen (Gōjū-ryū) also researched Bōgu-tsuki Karate. While these attempts appear to have remained limited to personal studies, it is obvious that various karate practitioners of the pre-war days aimed towards a modus of direct blows fascilitated by wearing protective equipment. Following the miliary defeat of Imperial Japan in 1945, before long the birth of karate organizations began on the mainland, centered around those emphasizing protective equipment. There were the Kanbukan 韓武舘, the Yōseikan 養成館 (i.e. the later Chitōkai 千唐会), the Renshinkan 錬心舘 and others. The Kanbukan was a karate dōjō in Tōkyō. It was one of the cradles of Bōgu-tsuki Karate. Established by leading disciples of Tōyama Kanken, and with his permission, it followed Tōyama’s non-school principle. Kumite was carried out in the form of Bōgu-tsuki Karate using kendō equipment. The leading role of the Kanbukan in Bōgu-tsuki Karate was spearheaded by deputy director Kinjō Hiroshi 金城裕 and director Yun Heui-byeong 尹曦炳. 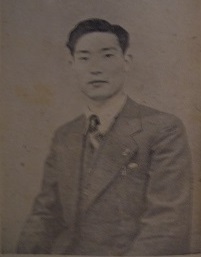 Deputy director Kinjō Hiroshi was also the leading karate journalist of the postwar period. Kinjō had studied under Okuzato Shōgen, Chinen Sanda, Ōshiro Chōyo, Maehara Chotoku, Tokuda Anbun, and Hanashiro Chōmo and also received an instructor diploma (shihan menjō) by Tōyama Kanken. 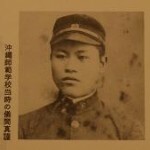 Yun Heui-byeong was a disciple of Tōyama’s and of Korean nationality. It is said he was made director of the Kanbukan in order to allow for the practice and spread of karate under the postwar Budō ban stipulated by the GHQ. With a Korean director, various activities such as karate practice and publication of books and magazines were easily possible. In fact, the name Kanbukan means “House of Korean Martial Arts.” As regards this, Kinjō Hiroshi noted that “As a Korean national, director Yun in those days belonged to the privileged class of third country nationals.” It should be noted, though, that in fact karate seems not to have been considered under the Budō ban by the allies, which mainly targeted the old ideological networks. Kendō remained prohibited quite long, but jūdō was allowed again realtively early. On karate, there seems to be no mention at all in relation with the Budō ban. Karate book published by Yun Heui-byeong and Kinjō Hiroshi in 1947. During his term as the director of the Kanbukan, Yun Heui-byeong published an address register of karate. Therein the Kanbukan dōjō was displayed under the name of “Kokusai Karate-dō Renmei Kanbukan” 国際空手道連盟韓武舘. In this, Yun anticipated the worldwide popularization of karate and was also the first who used this kind of naming convention, which is found abundantly today. Due to the impact of the Korean War (1950 – 1953), Yun had to return to South Korea in 1949. Besides becoming a professor at Seoul National University, Yun also taught karate at the jūdō dōjō called the “Korea Kyūbukan” 朝鮮研武館 in Seoul and opened a karate dōjō called Chidōkan 智道館 in Busan. As the name for a Korean martial art he advocated the name Tae-su-do 跆手道, using the character hand “手” as in karate. However, instead the name Tae-kwon-do 跆拳道 became popular. 1954 – The development of the Karate-kūtā as the first Karate-specific protective equipment is finished. The 1st Nationwide Karate Championship is held according to armor rules. The tournament is still run and is therefore the national Karate tournament with the longest history. After Yun’s return to Korea in 1949, the Kanbukan closed in 1950. Although the Kanbukan existed merely 5 years it greatly contributed to the unbroken inheritance of the genealogy of budō karate in bypassing the budō ban of the GHQ immediately after Imperial Japan’s defeat in 1945. In addition, it was also a pioneer in kumite competition, is the predecessor organization of the Renbukai, and brought forth stalwarts of the karate world such as Sō Neichū 曺寧柱 as well as Sō Neichū’s disciple Ōyama Masutatsu, who would also show up at the Kanbukan and thrust the Makiwara etc. 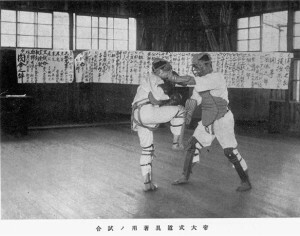 While Ōyama didn’t like protective equipment, the concept of direct strikes employed by the Kanbukan also affected Ōyama Masutatsu and thus the birth of Kyokushin karate. Moreover, the Kanbukan did not only preserve karate as a mere tradition, but also established a foundation for modern karate to develop for future generations. From these reasons the achievements of the Kanbukan are considered immeasurable in the history of postwar karate. The Kanbukan’s successor institution was opened in 1951 under director Nakamura Norio and called Renbukan 錬武舘. It was situated inside the Onko-gakkai in Shibuya-ku, Hikawa-chō. Sai Chōkō, influential Taiwanese business man, jūdōka, karateka, white crane boxer, supported the Renbukan, and became president of the (old) JKF. Below in the picture is Yamaguchi Gōgen. With the support of Taiwanese businessman Sai Chōkō 蔡長庚, the Renbukan aimed at the unification of the Japanese karate circles by way of Bōgu-tsuki Karate. 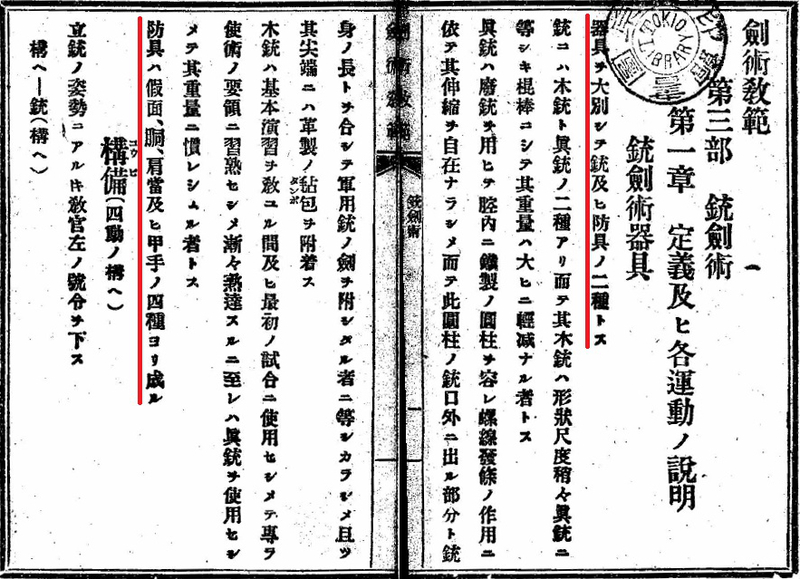 In December 1954, in the auditorium of the Kyōritsu Joshi Gakuen, the first ever nation-wide karate tournament was hosted by the Renbukan, called “National Karate-dō Championship Series” (Zenkoku Karate-dō Senshuken Taikai). Of course, this was held under Bogu-tsuki Karate rules. Five years later, in 1959, the next stage saw the establishment of the original (old) Japan Karate Federation (JKF; Zen Nihon Karate-dō Renmei) as “a unified organization of karate that goes beyond schools thinking.” Many leading characters of the karate cirles at the time took office. Tōyama Kanken’s Shūdōkan served as the GHQ. President and largest supporter was the Taiwanese Sai Chōkō (White-Crane-Boxing, jūdō), vice presidents were Kinjō Hiroshi (former Kanbukan) and Konishi Yasuhiro (Shindō Jinen-ryū). Among the advisers were Ōtsuka Hironori (1892–1982; Wadō-ryū), Motobu Chōki’s student Yamada Tatsuo (Nihon Kenpō Karate-dō), Gima Shinkin (Shōtōkan-ryū) and others. On the board of directors was Tamotsu Isamu (Renshinkan) and others. This old JKF a variety of schools and expand branches nationwide, including Okinawa. It organized the “All Japan Karate-dō Federation Championship Series” (Zen Nihon Karate-dō Renmei Senshuken Taikai) under Bōgu-tsuki rules, in which athletes of the Renshinkan, the Chitōkai, and from Okinawa also participated. 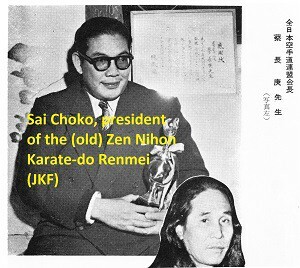 In 1964 the (new) JKF (Zen Nihon Karate-do Renmei) with its current sundome rules was formed. The (old) JKF relinquished its name to this new JKF and affiliated with it under the name of Zen Nihon Karate-dō Renmei Renbukan. It was decided that the Renbukan henceforth should serve as a cooperation organization to oversee the Bōgu-tsuki Karate of the new JKF. It should be noted that there are many different groups active in Bōgu-tsuki Karate and that it becomes more and more international. New Menhō VI von Mizuno. While in Sundome Karate protective equipment such as the menhō メンホー might also be used, in order to actually hit with full impact protective equipment in Bōgu-tsuki Karate has to be one that does not break and that prevents heavy impact on the brain. 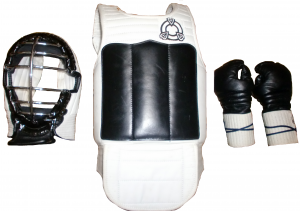 There are different kinds of protective equipment approved by the different federations and at tournaments. 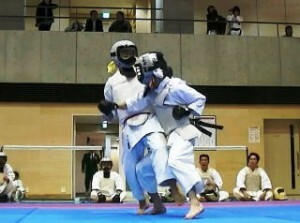 In addition, there is also tournaments that allow the use of Taekwondo trunk protectors. 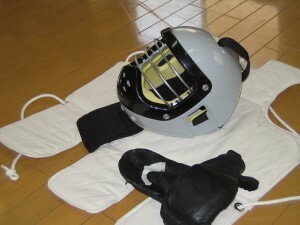 The main protective equipments used in Bōgu-tsuki Karate are referred to below. Completed in 1954, this protective equipment was used in the 1st national tournament of the Karate world, the “National Karate-dō Championship Series” (Zenkoku Karate-dō Senshuken Taikai). Still today it is the specified protective equipment of the Genwakai 玄和会. It was created in reference to Kendō protective equipment, but for the use in Karate, with raw materials mainly being cloth and leather. There were many problems such as safety issues due to cracks, sanitary issues like becoming moldy, heavy and hard to move with, old design, and its high price. 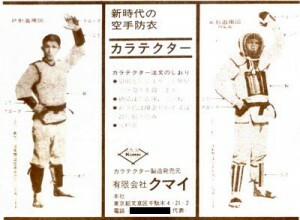 The specified protective equipment of the Renbukai developed from Kendō protective equipment → Karate-kutā (1954) → Strong Man (old model) (1981). It looks somewhat similar to Kendō protective equipment. It has been developed in order to overcome issues that arose with the Karate-kutā. The Strong Man (old model) was adopted as the specified protective equipment in 1981 for the 20th National Tournament. However, due to its poor fit and other issues, and as the cushioning at the back of the head was thin, in case of a nasty blow or of someone would fall on the back of the head, the Strong Man (old model) still posed potential danger such as accidental deaths that had occured in the past. In fact currently, most of the athletes who are using the old model often insert a towel between the headgear at the back of the head and the jaw. Most of the organizations other than the Renbukai adopted the “Super-safe”, which was developed around the same time (1981), and also not adopted the Strong Man due to pain during movement, discomfort, its old design etc.pp. In 2004 the Strong Man (new model) was developed with a padding at the back of the head (improved shock resistance), better breathability, and a feeling of correct fit, and moreover, the former range of vision which was previously confined was improved considerably. But there are still pros and cons, such as that the weight problem which has not yet been resolved. Among its characteristics is the iron grid masked viewing window which doesn’t break even at a serious impact. But, there is also the opinion that the danger of injury to the neck remains from the weight of the head gear when receiving a blow. In addition, it has a narrower field of vision than the “Super-safe.” Due to the iron surface there is still the risk of injury during impact when the feet and fists are not trained on a regular basis. In addition, in 2007 a new chest protector (dō 胴) model was released. It lost the mounting straps similar to those of the Kendō chest protector used until then, and besides adopted a bellows-kind of form which improved the feeling of correct fit. 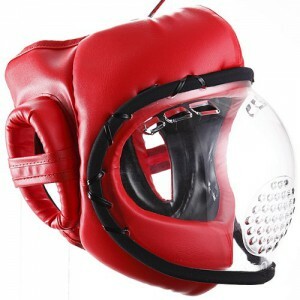 Face protector widely adopted in many organizations of Kōshiki Karate and Bōgu Karate. 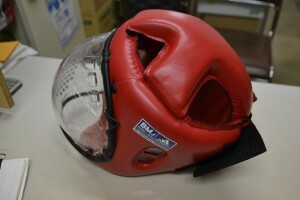 The “Super-safe” is also referred to as the “fishbowl helmet” (金魚鉢メット) and has a form of a kickboxing headguard to which a round transparent plastic face part is added. Besides Kōshiki Karate and Bōgu Karate it has also been adopted in various tournaments, for example at the Hokuto-ki 北斗旗 full contact tournament of the Daidō-juku 大道塾, it is sturdy and rarely cracks. It has a wide field of vision, light injuries are also few, although the plastic part is likely to become fogged. In addition, although the Strong Man absorbs the shock of the impact, since it protrudes to the front and the fighting distance is close, the chance of damage to the neck increases when arced hooks are used. The Super-safe is a product similar to the K-Protector (Kプロテクター) and the Shield-men (シールド面). 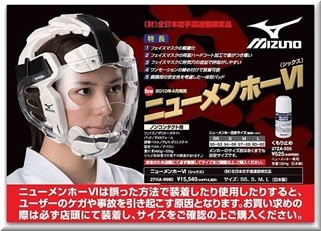 The K-Protector is sold by Martial World (マーシャルワールド). In comparison to the Super-safe, its visibility is wider and it has a greater damage-absorption on impact to the head. But because with 750g it is heavier than the Super-safe (500g), in case of penetrating impact the potential damage to the neck is larger. A prototype Adidas Shield-men at Tōyō Budō-gu. Shield-men is sold by Tōyō Budō-gu 東洋武道具 and has become the specified protective equipment of the Japan Protector Karate Federation (JPKF, Zenkoku Bōgu Karate-dō Renmei). Compared to the Super-safe (¥16,800) and K-Protector (¥15,540), the Shield-men is cheaper (¥13,650). In addition, the former two are tied with two strings at the back of the head, while the Shield-men is equipped with a velcro fastener which makes it easier to put on. Moreover, to mitigate the impact, a rubber tube is sowed to the jaw portion and it also has a protective padding attached on the top of the head. While the tube of the initial model got easily disconnected, the improved model has a rubber pad protecting the entire circumference of the shield part. 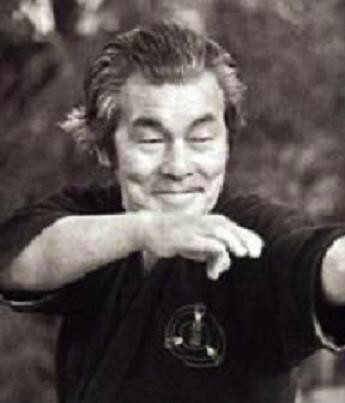 1922 – Funakoshi Gichin performed Kata at the “First Physical Education Exhibition” (1922). 1927 – The Karate Kenkyūkai of Tōkyō Imperial University independently devised Bōgu-tsuki Karate and introduced Kumite practice with it. 1929 – Funakoshi Gichin resigns as an instructor of Tōkyō Imperial University. It is said that he did so because he was furious about Bōgu-tsuki Kumite. According to his students Ōtsuka Hironori (Wadō-ryū) and Konishi Yasuhiro (Shindō Jinen-ryū), Funakoshi only taught 15 kata and [knew] no applications. 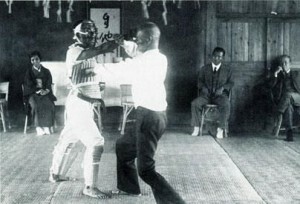 Around 1930 – Experiments with the use of protective equipment were carried out at the Karate Kenkyūkai of the Tōkyō Imperial University, by Mabuni Kenwa in Ōsaka, Yamaguchi Gōgen at the Ritsumeikan University in Kyōto, Miyagi Chōjun of Gōjū-ryū and others. 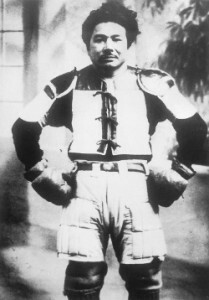 In addition, in Okinawa for a period of time matches in protective equipment were carried out under the name of Okinawa Kenpō. 1931 – Tōyama Kanken opens the Shūdōkan in Tōkyō. 1945 – Kanbukan established by Yun Heui-byeong and Kinjō Hiroshi in Tōkyō metropolitan area Chiyoda-ku Kudan. Both were students of Tōyama Kanken. 1946 – Beginning of Bōgu-tsuki Karate using Kendō protective equipment. 1946 – The Yōseikan opens in the Waifu neighbourhood of Kikuchi district in Kumamoto prefecture. It later developed into the Chitōkai. 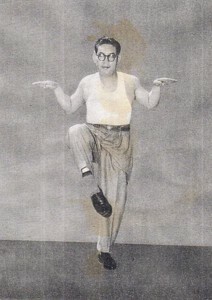 1949 – Director Yun Heui-byeong returned to Korea, participated in the invention of Taekwondo. 1950 – The Kanbukan closes. 1951 – The Renbukan is established by Nakamura Norio inside the Onko-gakkai in Shibuyaku Hikawa-chō. It inherits and continues the Bōgu-tsuki Karate of the Kanbukan. 1953 – Development of Karate protective equipment was begun to replace the previous Kendō protective equipment. 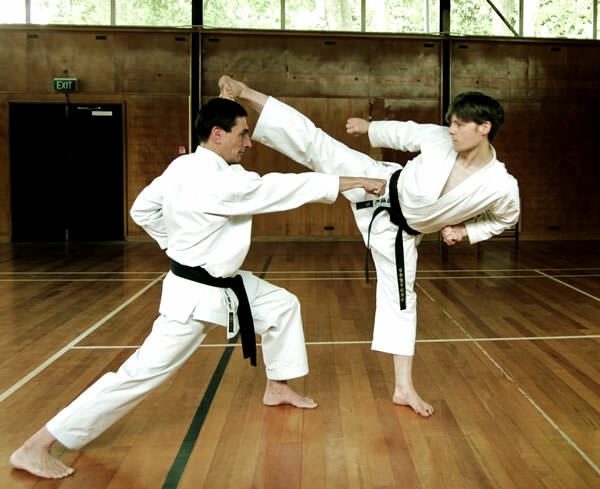 1954 – The development of the Karate-kūtā as the first Karate-specific protective equipment is finished. 1st Nationwide Karate Championships are held according to armor rules. The tournament is still run and is therefore the national Karate tournament with the longest history. 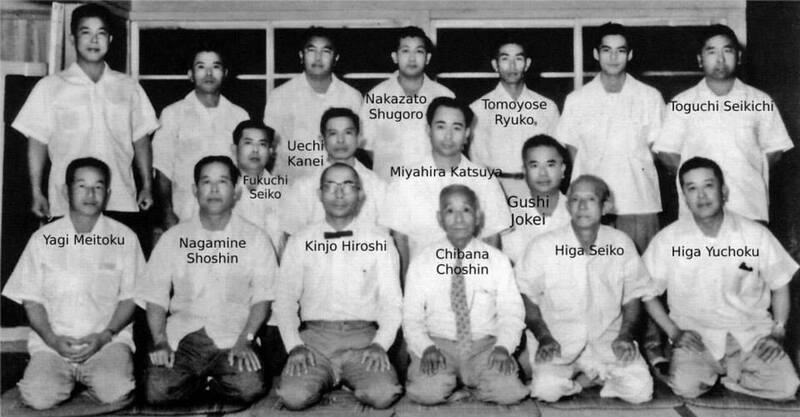 1955 – The Shōrin-ji-ryū Karate-dō Kenkyūkai Renshinkan is established in the Kōrai neighbourhood of Kagoshima City. 1959 – With Tōyama Kanken’s Shūdōkan as its general headquarter, the (old) Zen Nihon Karate-dō Renmei is established. President Sai Chōkō, vice-presidents Kinjō Hiroshi (Kanbukan) and Konishi Yasuhiro (Shindō Jinen-ryū), advisers Ōtsuka Hironori (Wadō-ryū), Motobu Choki’s student Yamada Tatsuo (Nihon Kenpō), Gima Shinkin (Shōtōkan-ryū) and others. On the board of directors was also Tamotsu Isamu (Renshinkan) and others. Athletes from the Renshinkan and Chitōkai also entered the Bōgu-tsuki competitions. Since the 2nd half of the 1950s – On Okinawa armored sparring matches were carried out apparently with the gear developed by Tamotsu Isamu of Renshinkan Shōrinji-ryū from Kendō protective gear. Tamotsu was the contact for Nakamura Shigeru, Nakazato Jōen, and Shimabukuro Zenryō for both the JKF and for Bōgu-tsuki Karate. 1960 – Establishment of the “Zen Nihon Karate-dō Renmei – Okinawa District Special Headquarters.” President Shimabukuro Zenryō (1908–1969), board member Nakamura Shigeru (Okinawa Kenpō), counselors Kaneshima Shinsuke (Tōzan-ryū) and Yonaha Seiyu (Shōrin-ryū). 1963 – within the western Japan region of the (old) JKF, an internal division occurrs. Factions from western Japan separated and formed the “Western Japan Karate Federation,” with Tamotsu Isamu of the Renshinkan as its president. 1964 – For the sake of the development of the Karate circles, the Renbukan disponed the name “JKF” for the establishment of the current (new) JKF. The Renbukan becomes a cooperation organization. Sundome rules become the mainstream. Bōgu-tsuki Karate is continued in the Renbukai, but without continuation of the National Tournament. 1967 – The Renshikan holds the “1st Shōrinji-ryū National Karate-dō Championship Series” in Kagoshima City. 1974 – The Renbukan changes its name to JKF Renbukan (Zen Nihon Karate-dō Renmei Renbukan). 1978 – Inauguration of the “Organizing Committee for the Improvement of Armor.” It aims at the development of new protective equipment. 1978 – Kudaka Masayuki develops the “Super-safe” protective gear. 1978 – Renbukan’s Nakamura Norio resigns from his office as the vice president and leaves for the Renbukai. 1981 – The “Karate-kūtā” as the specified protective equipment of the Renbukai is replaced by the “Strong Man” protective equipment. 1981 – The “Zen Nihon Kōshiki Karate-dō Renmei” is established and holds the “1st Zen Nihon Kōshiki Karate-dō Championship Series.” The Renbukan honbu dōjō resigns from the Renbukai. 1983 – Development of “Strong Man” protective equipment for girls and boys is completed. 1985 – The Renbukai opens its office in It opened an office in Tōkyō Shinjuku-ku, Shinjuku 4-chome. 1985 – At the end of this years‘ “Okinawa Tournament,” Bōgu-tsuki Karate is disconnected from the Inter-High Tournaments. 1999 – Centered around the Bōgu-tsuki Karate-dō federations of Tōkyō and Saitama Prefectures, the International Bōgu-tsuki Karate-dō Federation (Kokusai Bōgu-tsuki Karate-dō Renmei) is established. It branches off from the Renbukai and becomes an independent organization. 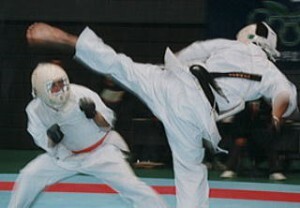 2000 – Friendly competition between Renbukai and Kōshiki Karate at the “21st All Tōhoku and Hokkaidō Bōgu-tsuki Karate Tournament,” which was held as a rehearsal for the National Athletic Meet. 2001 – Bōgu-tsuki Karate-dō performed as a demonstration contest under cooperation of the Renbukai during the “New Century Miyagi National Athletic Meet” (the 58th National Athletic Meet). 2002 – Kakutō Dageki Renmei is established..
2003 – Nakamura Norio retires from the Zen Nihon Kōshiki Karate-dō Renmei Nakamura-ha. Chiba Kenjirō (Gōbukan) took office as the second generation president. Since that time it is referred to as Chiba-ha. 2003 – The 1st Kurokawa Cup Karate-dō Championship and Cultural Exchange Tournament is held. 2003 – Nihon Bōgu Karate-dō Renmei is established, centered on Uesugi Katsumi, the deputy secretary-general of the Chiba-ha. 2004 – A new model of the “Strong Man” protective equipment is adopted by the Renbukai. 2006 – Founding of the All-Japan Bōgu Karate-dō Federation (Zen Nihon Bōgu Karate-dō Renmei). The “Nihon Bōgu Karate-dō Renmei” joins but their Kantō region branch leaves and joins/merges with the Kakutō Dageki Renmei. 2006 – A symposium of nine organizations of Bōgu-tsuki Karate is held under the auspices of the Nihon Bōgu Karate-dō Renmei. 2007 – The Zen Nihon Bōgu Karate-dō Renmei separates from the Tōkō Kyōkai and is reorganized as the Zenkoku Bōgu Karate-dō Renmei. 2007 – The designation Kakutō Dageki Renmei is changed to Zen Nihon Kakutō Dageki Renmei. 2009 – Among the Seishin-ryū factions that had split, with the Zen Nihon Seishinkai of Hokkaidō at its center the Zen Nihon Seishinkai Karate-dō Renmei is established. 2012 – The 50th Nationwide Bōgu-tsuki Karate-dō Tournament is held. Alongside demonstrations of the JKF Shitō-kai and JKF Wadō-kai were showcased. 2014 – The several sections of the Zen Nihon Kakutō Dageki Renmei are dissolved into the new organization called Zen Nihon Kakutō Dageki Karate-dō Renmei. 2015 – “Prayer for Restoration after the Great East Japan Tōhoku Earthquake – All Japan Protective equipment-Wearing Karate-dō Championship Series” was held under supervision of the Renbukan’s Miyagi Prefecture Bōgu-tsuki Karate-dō Federation. The “Sekai Kōshiki Karate-dō Renmei” and “Kokusai Chitō-ryū Karate-dō Renmei” joined as sponsors. The Renbukan with its Bōgu-tsuki Karate is still today one of 6 “Cooperation groups” of the JKF – together with JKF Gōjū-kai, JKF Shitō-kai, JKF Wadō-kai, JKA, and Nihon Karate Rengōkai. This entry was posted in Misc and tagged Bōgu-tsuki Karate, 防具付き空手. Bookmark the permalink.